What a great day to storm any Bastille-like challenge – such as another Race in the WS Spring Series!! 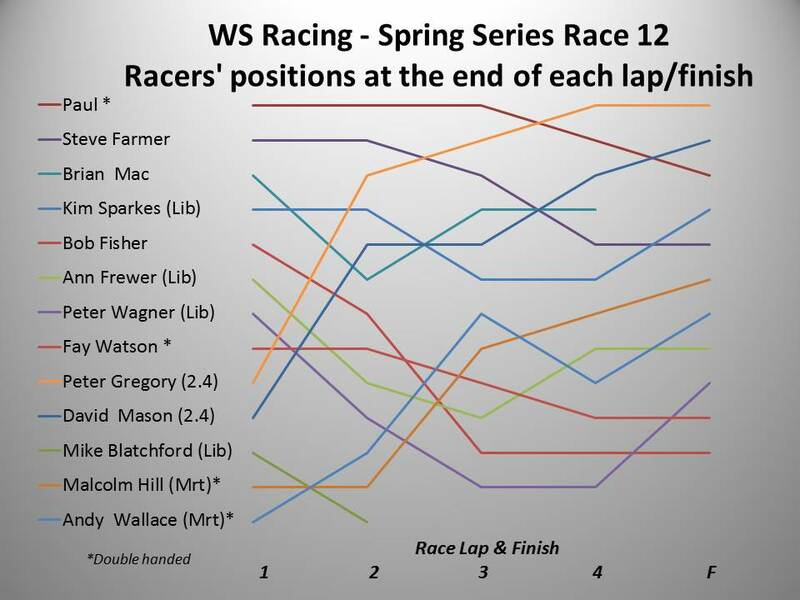 The overall WS Racers’ Positions have been updated on the Series Chart and the Lap Position Chart is shown below. Well done to David Mason and Andy Wallace for chipping away at the overall score for their five best places in all their qualifying races. David has moved up to 2nd equal with Kim and Andy is 10th equal with Brian! Only two more Races to go before we complete this Series. Excellent race reporting below by Bob Fisher – his insight amazes me, although I feel that the Trustees may wish to invite him in for an interview and some tests on his eyesight and hearing before validating the report. I have heard about a wild beastie missing from its normal sanctuary in Kent and that its keeper was leaving food out to encourage it to come home – so maybe Mike C might try that trick (it certainly works for my wife when she wants me back home from my travels to cut the grass etc.)! As Bob points out, Peter G in his red torpedo, with its shiny new white sails, did do incredibly well as he pretty rapidly overhauled every boat on the lake in front of him and then started to lap a few of the tail enders. He was sailing so fast that his momentum seemed to keep him moving forward and overtaking other boats even through the 5 minutes of lull that descended upon the lake during the third lap causing everybody else to stop in their tracks! Nevertheless the chart below shows how well Paul, Steve and Brian did in keeping themselves at the front of the race (albeit behind Peter G) for so long. And Brian Mac was sailing so well that he may well have held onto his 4th place if he hadn’t interpreted my shout of “Well done Brian”, as he was heading towards Mark K for the fourth time, as: “You’ve just finished the Race” instead of “KEEP GOING since you’ve got lots of folk breathing down your transom!” Next time we looked in his direction, Bob Marsh and I were astounded to see Brian heading in and so Bob called the pontoon on the radio to ask them to tell Brian that the race was still on! But too late, Brian had decided to give up his 4th place in favour of a nice hot cuppa tea! The handicapping system that delays the Start time between the boat classes really highlights how important it is for the 303s to get a REALLY GOOD START and then push on as hard as they can – because you know that the Liberty helms (if they can steer – sorry about your problems Mike, Kim and Peter, but it seems that weed may have got entangled around your rudders/keel) will only be 1 minute behind you. And although 9 or 10 minutes sounds like a long time, you have all seen how fast the 2.4 and Martin can be sailed once they have been let loose and when there is a half decent wind! I am a little conscious of the fact that at times I was so far behind, I missed most of the action. It would be good if others chipped in with their views on the race. But firstly a warning for those living in the Farnborough area. A huge black beast has been spotted running wild in the area. It’s been described as something akin to the beast of Bodmin. Local Police have warned people to stay indoors and only go out in Emefgencies. It has however been reported that some brave soul has been spotted chasing the beast for many miles shouting madly at him. police described the man as looking a little like Sailabilities Mike Coleman. This is a little disturbing as Mike wasn’t around on Thursday. Please remain calm during this difficult time. Stop Press Mike Blatchford has informed us that the Man was in fact Mike Coleman and the Beast was his pet Greyhound which he had decided to let run off his lead and didn’t want to come back. Secondly I have to report some shady dealings at Sailability. During school Thursday’s lunch I heard some of the members discussing the capabilities of the various 303’s. Apparantly the Red one (red robin?). And .kermit have been souped up to provide greater speed. I must admit I have noticed some of the volunteers smiling as they direct me to one of the ‘ lemons’. At first I thought this was just people having some fun by watching me sink ( last week) and encounter various other issues. But having noticed large sums of cash being discreetly handed around . (normally about £3) I can only assume I have encountered a betting syndicate. I do have photos if needed by the Police. And so to the race. Having run aground during the warm up I was a little nervous starting from K as we had a good field clambering for a good start. The double handed 303’s went off first and seemed to get away every quickly. As the single 303’s went off I seemed to be well placed, but as I often do I got to greedy and found myself sitting with he wind coming straight at me. I eventually managed to steer to Port just in time to intercept Kim in her Liberty and ruin her start. By now the whole field was miles ahead and I could hear the swishing of the faster boats and the feint hum of marine engines (surely not). Chomping at the bit behind me. More worryingly I could see Farmer about two marks ahead. My only hope was that he was asleep and would run aground somewhere. Due to a mishap with a 2.4 Mike and Peter were both in liberties and I was hoping that this might give me a chance of avoiding the wooden spoon. One by one everyone came past and a number of sailors decided to lap me. (Very unsporting chaps). Including grrrrr Farmer who I have to say was sailing very well. I have no idea of the order of finish but assume, Peter in the red torpedo was victorious again . Congratulations Peter and Kim despite my best attempts to ram her had a strong 2nd half of the race. Apologies to other high finishers who I only saw lapping me I can only report you travel a lot more quickly than me. In summary I can only blame my failings on sailing to tight to the wind and also a very tight boom, which I learned a little too late needed a little manual help when swinging back across the wind,..but in truth it was better sailing by my fellow competitors. As I trudged up sadly to the clubhouse. Mike Blatchford informed me that he had retired early because his Liberty refused to go around C. No wooden spoon for me then. Lastly congrats to Steve Farmer in running 10000 metres with his twin daughters to raise money for his charity Different strokes. I’m sorry to hear that Bob has been trying to ram you! I apologise on his behalf and shall have a word with him. I think a bucket of cold water before the next race should do the trick. And Bob, are you sure that you could ‘see me two marks ahead’? I’m not sure that you could possibly see that distance. I vote that you do the race report each week as, we don’t learn anything about out relative positions but we do laugh out loud as we read about the intrigue and plotting that’s going on in our midst! I do think that I need to do half in the 2.4 and half in the Liberty next series. I forgot how the Liberty sails like a bath tub! If you were there last Monday, you would have seen how competitive David Mason and I were for battling it out for 3rd and 4th places. Essentially we both tied. 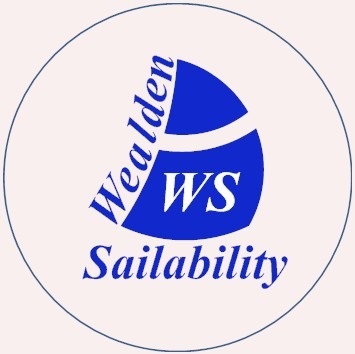 You will be very welcome to do that Peter – and the good news is that the RYA have bequeathed the two loaned 2.4s to WS since they have heard that we (that’s you, Mike B, David M and a few others!) have been having so much fun sailing them!! Nevertheless we also need to take a look at all three of the Liberty dinghies since they all seemed to be suffering from steering difficulties last Thursday. That’s great news! Yes I think I was hit by the weed last Thursday, though I don’t think we will get much wind this week just hot weather!